The SIHH 2009 starts on the 19th of January. Besides the MBandF pre-SIHH news I blogged about a few days ago, I won’t be posting that much about this event. Please keep an eye on the SIHH 2009 Forum over at Perpetuelle.com. This great forum does a full coverage on the SIHH expo. IWC is one of the first to give pre-SIHH introductions of their new models. The new Aquatimer series and Ingenieur series are quite interesting, however, you’ll have to logon to the official IWC Forum to see the pictures of these models. However, a few members of that forum attended an IWC Collectors Meeting where IWC had these new models on display. Click here and here for a number of interesting pictures. 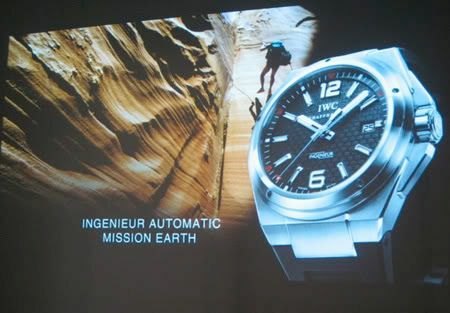 The new Ingenieur ‘Mission Earth’ will replace the good old Ingenieur Automatic ref.3227. The latter has been in production since 2005, so I am really curious what will happen to the prices of this model in the used market.